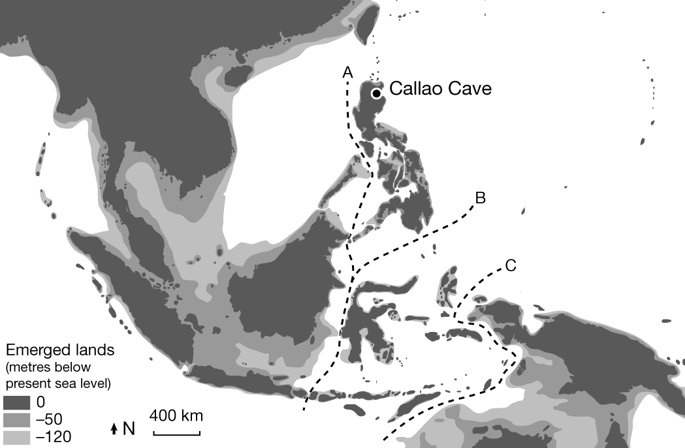 This newly identified species was found in the Philippines and named Homo luzonensis after Luzon, the island where bones and teeth from individuals of this species were excavated from Callao Cave. Specimens of H. luzonensis were dated to minimum ages of 50,000 and 67,000 years old, which suggests that the species was alive at the same time as several other hominins belonging to the genus Homo , including Homo sapiens , Neanderthals, Denisovans and Homo floresiensis . From past experience of reports of “new species of Humans” I’m not going to get excited about this until much more information is published. Okay good. I didn’t want to edit any slides anyways. It’s much easier to have the position where Neanderthals, Denisovans, Naledi, etc. are just pre/post flood lineages of humans that lie outside modern variation or had some kind of deficiency/mutation. There could be other explanations for the unique combination of tooth features, he says. The group of individuals that reached Luzon was likely a random assortment of genotypes. With inbreeding over time, genetic drift could have pushed them to develop the unique characteristics that Détroit and his colleagues observed. So there’s a possibility that the remains represent merely an unusual island population of individuals, rather than a new species,Wood explains. Some researchers question whether the evidence is enough to warrant a new species designation. That’s a tricky one since population groups become more and more different over time after not interbreeding. But even then, what is a species anyways? It’s not anything real but a word to describe a demarcation between two population groups with a certain amount of morphological (how much?) and genetic (how much?) diversity. So there’s a possibility that the remains represent merely an unusual island population of individuals, rather than a new species,Wood explains. Which perhaps should constitute a ‘new species. That depends on the definition of species you use; which could be a thread of its own. Currently H Sapiens can encompass from an African pygmy to a tall blonde Scandanavian. This new find appears to be within that range. But even then, what is a species anyways? It’s not anything real but a word to describe a demarcation between two population groups with a certain amount of morphological (how much?) and genetic (how much?) diversity. You’re right, species is a classification of convenience rather than a fundamental biological group. Not only can we get breeding between different species but also between genera, so that’s probably an artificial division as well. The fundamental division is most likely the Biblical Kind. The fundamental division is most likely the Biblical Kind. Please do tell what that’s supposed to be/mean? Even if the species designation is premature, these remains add to the evidence of an ancient race of dwarves living in southeast Asia. Legends of such creatures are found all over Indonesia. ancient race of dwarves living in southeast Asia. No need to postulate an ancient race of dwarves. There are candidates living today. The researchers are cautious about estimating H. luzonensis ’ height, because there are only a few remains to go on. But given its small teeth, and the foot bone reported in 2010, Détroit thinks that its body size was within the range of small H. sapiens , such as members of some Indigenous ethnic groups living on Luzon and elsewhere in the Philippines today, sometimes known collectively as the Philippine Negritos. I wonder if viruses were a biblical kind? Is multicellular a more essential kind distinction than that between the plant and animal kind? It doesn’t seem the switch in terminology evades any of the thornier issues. I note that the number of kingdoms is up since I first studied biology. The splitters seem to be winning. Not only are there more of them but they too have been divided into (so far) two super kingdoms. That the two kingdoms of bacteria should require a separate super kingdom makes me wonder why bacteria generally should be considered more different from everything else than a sponge is different from a redwood is different from an algae is different from me? That the two kingdoms of bacteria should require a separate super kingdom makes me wonder why bacteria generally should be considered more different from everything else than a sponge is different from a redwood is different from an algae is different from me? Doesn’t it have to do with the structure of the cell? Sponges are very different from humans, but when you get down to the cellular level, they are both eukaryotes, which are very different from prokaryotes. It is considered the most important distinction between organisms. Isn’t it interesting that the Philippines is one of the places where they have myths/folklore of a little people? Little people have been part of the folklore of many cultures in human history, including Ireland, Greece, the Philippines, the Hawaiian Islands, New Zealand, Flores Island, Indonesia, and Native Americans. Just because something is myth doesn’t mean there is no basis for it in historical fact. On the other hand, humans have a strong tendency to embellish the facts even when it is about something historical. Interesting but irrelevant since the authors say they are within the range of populations existing today in that area. Given the limited specimens found are they even sure the remains are human? Could it be an ape? That is an interesting question. As a lay person in the field, I would have no idea as to how to recognize human from nonhuman. I can see that they have measurements that graph out and compare to other know examples, and those measurement provide a relatively objective way to determine what species it came from. That doesn’t really answer the question of “Is it human?” After all, what does it mean to be human? Incorrect. It is this being within the range of existing populations which is irrelevant. It is the difference between the averages that characterize identifiable groups.